Crystals and gemstones have been eagerly sought after for thousands of years as items of beauty and items of power with mysterious gifts. There are many different ways that crystals and other stones have been used to enhance daily life . 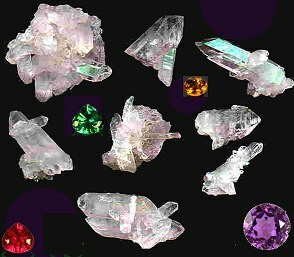 This workshop and list focuses on some of the ways that these crystals and other stones are used in healing for self and and in promoting spiritual development and for assisting with protection, to draw abundance to enhance meditation, to broadcast affirmations and to assist in psychic and spiritual communication. There is never only one way to do anything. We can explore many different forms of crystal healing practices. Some are more effective for more people than are others but all have value. Each Crystal or stone has a potential of specialized gifts for us. Each can Draw in and radiate healing energy specific to each stone and/or amplify spiritual energies. The uses of crystals and stones as energy transmitters of spiritual information and vibration is almost unlimited. This energy may be seen as being the elemental energy of the stone itself and/or as the Spirit essence being. The conscious aspect of all stones of a particular kind. Some people work with crystals as tools to draw in and direct energy in a rather mechanical way as channels of abstract energies. Others may speak with and invoke the stones as spirit entities. Some people hold that the effect of a stone to facilitate healing or meditation or other dimensional journeying is a side effect of the actual chemical composition of the particular stone. Some of us find that any and all ways of defining how or why crystal healing works are true and will indeed work. Many people start working with crystals in a rather mechanical way as tools rather than as beings and only later become aware of the spiritual conscious wisdom and nature of crystals as Beings . We believe Everything is alive and conscious but that if you do not have that belief crystals will still work with you. Science Has scorned the mystical aspects of crystals and stones but have sought medicine and technological assistance from the rocks and minerals of the world . Crystals are used in many scientific applications. It is common for people to be amused and disbelieving about the healing and spiritual effects of crystals beyond the chemical and to dismiss mystical experiences as imagination. Imagination is the gateway to transcendent experience. Intuition has as much value as the often more respected rational mind. You may or may not feel the energy of crystals or hear messages from them but you can still benefit from using them and connecting with them. The details of the healing crystals which is informative and huge within your analysis. The scientific reason which you have shared within, could be useful to know.